As part of our WEEE awareness campaign we'll be holding a Restart Party alongside a give-and take event at Shacklewell School, Shacklewell Row, E8 2EA. We'll be in a covered outside space (but there is a plan B). The school is 15 minutes walk from Dalston Junction or 10 minutes from Dalston Kingsland. Click here for directions. We hope to see lots of our regular fixers there! Please don't leave it to the last minute - we may not have capacity to see you if you arrive in the last hour. If we are busy we will only be able to deal with one item per person. Remember: we're happy to help you learn how to repair, we are not repair professionals, and Restart Parties are a community self-repair event. Please take responsibility for your own gadget, your own data, so do not forget to back-up your data. 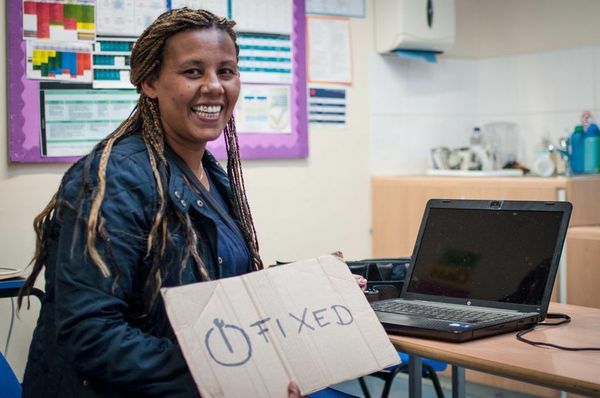 RSVP for Hackney Fixers Restart Party - WEEE campaign to add comments! Hi Michael, going bang could mean something like an internal fuse has gone which could be easy to replace, but we'd need to look at why it blew. We can have a look if you are prepared to bring it to the event, and help you understand what is wrong, and what parts are needed if any. You can also find repairers on our repairers map. If it is only 2 years old it may still be in warranty? I realise staff and time are limited but I would like to have fixed, rather than throw into a recycling bin, a bust two-year-old HD TV. It went bang and now it won't come on at all. I hope someone could repair it if poss, there is no way I could be taught to do so as I simply don't have the background (and that would be twice as complicated). I would welcome your views on this, which must be a common enough problem. I appreciate that give and take events are (mostly) Council ones but would it be possible to get whoever organises those and puts details of them onto the Council website to list them on SH, too? The notice in the events list mentioned that this was happening alongside a give and take event but this detailed entry doesn't mention it - and I can't find a separate detailed notice for the latter, either. It would be really helpful if give and take events were better publicised here; they're such a good idea. Please would someone clarify what exactly is happening on this occasion, at least.